This 10 year guarantee is valid on all of the buildings that are manufactured by Sheds N Chalets and that are purchased after 1st March 2017. 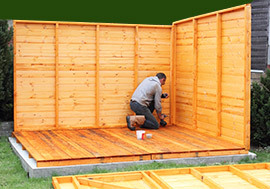 The guarantee is only for protection against timber rot and decay and does not cover floors, roofs or felt. The guarantee does not cover the product against splits, knots or warping which may occur naturally over time. The felt has a one year guarantee only. All Buildings should have a suitable base. Windows must be sealed annually by customer with silicone. The product must have been fitted by our fitters. The building must not be in contact with any trees. The product must not be adapted in any way.